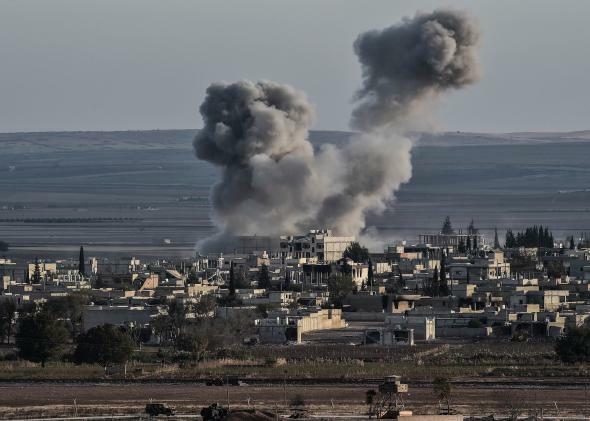 Smoke rises after an airstrike from US-led coalition in the city of Kobani on November 9, 2014. The House of Representatives yesterday rejected an amendment to a defense bill that would have forced them to vote on a formal authorization for the ongoing military campaign against ISIS. The rejection of the amendment proposed by Rep. Adam Schiff of California was not the first time Congress has seemed oddly unconcerned by the fact that it has never authorized a now year-old military intervention in two Middle Eastern countries. But this vote seems particularly noteworthy, coming a few days after President Obama announced plans to dispatch an additional 450 military trainers to Iraq and the U.S. military said it’s considering establishing more bases in the country. Obama sent a proposed ISIS war authorization to Congress in February, months after the military operation began, but lawmakers seem unlikely to vote on it, or an amended one. Some Republicans would like to see stronger measures in the authorization—the one Obama proposed rules out ground combat troops—while many Democrats are worried it will lead to another long U.S. military engagement in the Middle East. With the exception of a few lawmakers who have been repeatedly pushing for a vote—notably Democrats Schiff and Sen. Tim Kaine and Republicans Rand Paul and Jeff Flake—most members of both parties seem content to avoid taking responsibility for the conflict by letting the White House do whatever it wants. Given the lack of pressure, it’s not that surprising that the White House has barely bothered to explain how it’s legal to bomb two countries for nearly a year without a Congressional authorization. As Marisa Taylor and Jonathan Landay of McClatchy report today, “the only document the White House has provided to a few key lawmakers comprises four pages of what are essentially talking points described by those who’ve read them as shallow and based on disputed assertions of presidential authority.” The White House has refused to acknowledge if it has even asked for written legal analysis of the conflict. The ACLU filed a Freedom of Information Act request for documents related to such an analysis, but nothing has been turned over so far. The White House has argued that it has the authority to conduct the operation under the remarkably expansive 2001 authorization for the use of military force against al-Qaida that was passed after 9/11, as well as the 2002 authorization for the invasion of Iraq. These are both highly dubious claims: ISIS didn’t exist at the time of 9/11 and is at war with al-Qaida, and the target of the 2002 resolution, Saddam Hussein’s regime, is long gone.But, absent any oversight, the flimsy rationale will continue to serve for the ongoing air campaign, the ramped-up training mission, and additional Special Forces raids, not to mention whatever measures Obama’s successor decides to pursue.